The 2 lateral ventricles are the largest of the ventricles. They are irregular in shape. Each consists of a central part, with anterior, posterior and inferior horns. Is anterior to the interventricular foramen. Its roof and anterior border are formed by the corpus callosum, its vertical medial wall by the septum pellucidum. The floor is formed by the head of the caudate nucleus. Extends from the splenium of the corpus callosum; medially, by the posterior part of the septum pellucidum; and below, by parts of the caudate nucleus, thalamus, choroid plexus and fornix. Extends into the occipital lobe. Its roof is formed by fibers of the corpus callosum. It traverses the temporal lobe. Its roof is formed by the white substance of the cerebral hemisphere. Along the medial border is the stria terminalis and the tail of the caudate nucleus. The amygdaloid nucleus bulges into the terminal part of the inferior horn. The floor and the medial wall are formed by the fimbria, the hippocampus and the collateral eminence. 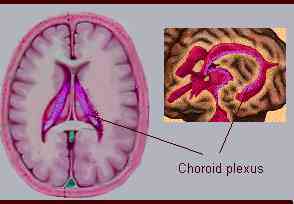 The choroid plexus of the lateral ventricle, fringe-like process of pia mater projecting into the ventricular cavity and covered by an epithelial layer of ependymal origin. A triangular process of pia mater projecting upward into the body of the lateral ventricle covers the lateral edge of the fornix and is known as tela choroidea. Author: Silvia Helena Cardoso, PhD. Psychobiologist, master and doctor in Sciences by the University of São Paulo and post doctoral fellowship by the University of California, Los Angeles. Invited Professor and Associate Researcher of the Center for Biomedical Inofrmatics, State University of Campinas (Unicamp), Brazil. Reviewed and commented by the neuroanatomist Dr. Norberto Cysne Coimbra , MD, PhD. Neuoanatomist, Neuroscientist, Molecular Biologist. Laboratory of Neuroanatomy and Neuropsichobiology, Department of Morphology, Faculty of Medicine, Ribeirão-Preto USP (São Paulo), Brazil.